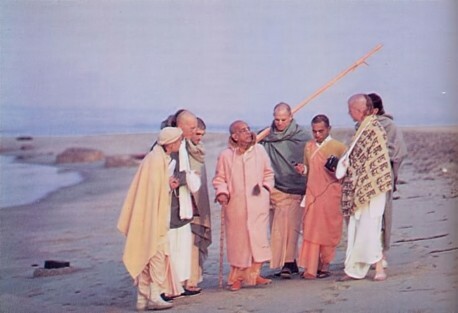 For many years, His Divine Grace A.C. Bhaktivedanta Swami Prabhupada, the spiritual master of the Krishna consciousness movement, has every day customarily taken an hour-long early morning walk with some of his disciples wherever in the world he is then preaching. Sometimes His Divine Grace says little; he simply chants Hare Krishna on his beads and walks. Sometimes, however, he holds animated discussions or even arguments, challenging disciples to defend materialistic viewpoints so that he can defeat them with Krishna consciousness. The following dialogue was recorded on an inspired morning walk at Venice Beach, Los Angeles. Walking with Srila Prabhupada were two of his disciples, Karandhara dasa and Svarupa Damodara dasa, a chemist working on his Ph.D. in Physical Organic Chemistry at the University of California. Again, Krishna says, jyotisam ravir amsuman: “Of lights I am the radiant sun.” [Bg. 10.21] Also in the Eleventh Chapter of Bhagavad-gita Arjuna tells Krishna, sasi-surya-netram: “The sun and moon are among Your great unlimited eyes.” [Bg. 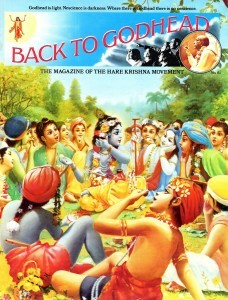 11.19] This knowledge is contained in Bhagavad-gita, but scientists cannot attain this knowledge by their speculation. Can they? Svarupa: It is not possible. Svarupa: We have to take knowledge from the supreme knower. Srila Prabhupada: For perfect knowledge we have to approach a superior person, a guru. One may try to learn a subject by reading books at home, but he can learn much better by going to college and approaching a professor. In the same way, we have to approach a guru. Of course, if we encounter a false guru, our knowledge is false. But if our guru is perfect, our knowledge is perfect. We accept Krishna as our guru. If He is perfect in knowledge, our knowledge is also perfect. As far as we’re concerned, we do not have to be perfect in ourselves, but if we receive knowledge from the perfect, our knowledge is perfect. We cannot say that we understand that there are 900,000 species of life in the ocean because we have studied the entire ocean. Rather we say that we take this information from scriptures and therefore it is perfect. This is the Vedic process. Scientists may carry out much research work, but however great a scientist may be, his senses are imperfect. Therefore he cannot have perfect knowledge. What is the value of our eyes? We cannot see without sunlight, nor can we see small things without a microscope. Our eyes are imperfect, and the instruments our eyes have discovered are also imperfect. How, then, is it possible to get perfect knowledge? Because the living entity is limited, his knowledge is limited. A child may know that two plus two equals four, but when he speaks of higher mathematics, we do not take him seriously. The senses through which a scientist acquires knowledge are limited and imperfect; therefore his knowledge is limited and imperfect. In his ignorance he may claim to know everything, but that is simply nonsense. A blind man may lead another blind man, but what does it avail them when they both fall into a ditch? The laws of nature bind us hand and foot, yet we think we are free to speculate. This is illusion. Although conditioned by so many of nature’s laws, the rascals think they are free. Yet if there is a cloud, they cannot see the sun. What power have we to see? Only when nature’s laws give us some facility are we able to see. Indeed, we can only experiment under certain conditions, and if the conditions are not favorable, our experiments fail. Why then, are we so proud of experimental knowledge? Why experiment? Things are already there. The sun’s energy is there, given by God for us to use. What else is there to know? So many apples fall from trees. What further need is there to explain the law of gravity? Actually the scientists are lacking in common sense. They are simply concerned with “scientific” explanations. They say the law of gravity works only under certain conditions, but who has made these conditions? When Krishna appeared as Lord Ramacandra, He threw stones on the water, and the stones floated. The law of gravity did not work in that case. Therefore the law of gravity works only under the direction of the Supreme Lord. The law in itself is not final. A king may give a law, but he can change that law immediately. The ultimate law-giver is Krishna, and a law will only work by His will. Scientists try to explain God’s will in so many ways, but because they are conditioned by maya, illusion, they can only talk like a person haunted by ghosts. Tell me, what is the scientific explanation that accounts for all the varieties of trees? Karandhara: They say that nature mutates and makes these varieties. Srila Prabhupada: Then it must be nature’s will. And what is that will? Does the land have any will? Karandhara: Well, they are very vague on that point. 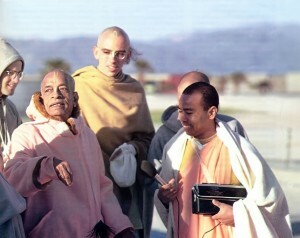 Srila Prabhupada: That means that they do not have perfect knowledge. They do not know that behind nature is the will of Krishna. Svarupa: They explain that the chemical composition of these different plants is different. Srila Prabhupada: That’s all right, but who made these chemical compositions? As soon as you say “chemical composition,” you immediately require a God. Srila Prabhupada: God or not, there must be some will. There must be some consciousness. Two chemicals mix and produce such and such. Who mixes them? Consciousness is there. Well, that consciousness is Krishna. There is consciousness everywhere, and as soon as you accept that consciousness, you must accept consciousness as a person. Therefore, we speak of Krishna consciousness. In Bhagavad-gita it is stated that consciousness is all-pervading. You may have consciousness, and I may have consciousness, but there is another consciousness, which is all-pervading. My consciousness is limited to my body, and your consciousness is limited to yours, but there is another consciousness that is within you, me, and everyone. That is Krishna consciousness. Actually everything in the world is relative. That is a scientific fact. Our bodies, lives, intelligence and everything else are all relative. To us an ant may seem to have a very short life, but for the ant his life is about a hundred years in duration. That hundred years is relative to the body. Similarly, Brahma, who lives fantastically long from our point of view, only lives a hundred years from his point of view. This is relativity. Karandhara: Then the relativity is based upon our individual situation. Thus Brahma, by these calculations, lives for so many millions and trillions of years. We cannot believe this, although evidence is given in the scriptures. In other words, we conclude that Krishna talks nonsensically while we speak as authorities. Even great scholars say that these scriptural statements are all mental speculations. Although these men are nothing but rascals, they pass for reputable scholars. They place themselves above God’s position by attempting to refute or deny the statements of God in the revealed scriptures. In this way so many fools in the guise of scholars, scientists and philosophers are misguiding the whole world. Svarupa: Of course so much is being written about Darwin’s theory. In any library there are hundreds of books on his theories. Srila Prabhupada: Do they accept or reject them? Svarupa: Generally they accept him, but there are some who are very critical. Srila Prabhupada: Darwin speaks about the evolution of the species of life, but he has no real information about spiritual evolution. He knows nothing about the progress of the spirit soul from lower forms of life to higher forms. He claims that man has evolved from monkeys, but we can see that the monkey is not extinct. If the monkey is the immediate forefather of man, why is he still existing? Svarupa: Darwin says that the species are not created independently but are descended from one another. Srila Prabhupada: If there is no question of independence, how can he abruptly begin with a certain species? He must explain how the original species came into existence. Karandhara: Scientists claim that the earth was created by biological chemistry, and they refuse to teach God created the earth because they think everyone will consider them fools. Srila Prabhupada: If their biology and chemistry are so advanced, why don’t they create something? They claim they may be able to create life in the future, but why in the future? Life is already created. Is science based on the future? We should trust no future, however pleasant we may think it will be. This is the world, and it is given now. Everyone is thinking the future will be very pleasant, but what assurance do we have of this? They have to accept that they do not know what the truth actually is. They say that they are expecting to arrive at the truth in the future, but that is simply proof that their knowledge is imperfect. This is something like a bankrupt man giving a postdated check. What is the value of the man’s check if he has no money? Who will accept such a check? He may talk of having money in the future, but there is no assurance of this. They are claiming that their scientific method is perfect, and at the same time when a practical example is needed, they simply postdate the example. They claim to have millions of dollars worth of knowledge, but if you ask them a question, they simply give you a postdated check. Why should we accept it? They cannot even produce a spear of grass through their biological or chemical experiments. Nonetheless they are claiming that the creation is produced by some chemical or biological method. Why does no one question all this nonsense? Svarupa: In the ultimate analysis, when they consider the origin of life, they say that everything started from matter. In other words, living matter comes from non-living matter. 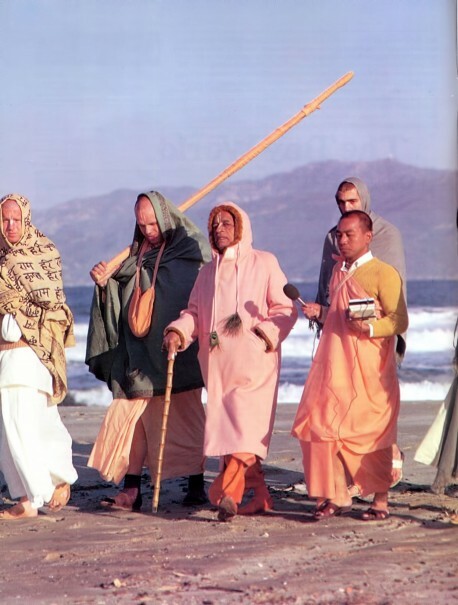 Srila Prabhupada: From where is this living matter coming now? Did it come from non-living matter in the past and not at the present? How is the ant coming? Is it materializing from dirt? Even an ant does not come from inert matter. What proof do they have of such a theory? Darwin claims that in the distant past no really intelligent man existed, that man simply evolved from the apes. If there were no intelligent brain in the past, how is it that these Vedic scriptures were written thousands and thousands of years ago? How do they explain a sage like Vyasadeva? Svarupa: They have no explanation. They simply say these are unknown forest sages. Srila Prabhupada: Vyasadeva may be unknown to them, but nonetheless he was there. How is it he got such a brain? He may be unknown to you or to me, but nonetheless his brainwork is there, his philosophy is there, his language, linguistics, poetic arrangements and verbal strength. You may not know the person, but you can understand the brain. Svarupa: Weren’t all the varieties of animals existing from the beginning? The evolution is the spiritual evolution of the individual living entity through the various species of life. If one enters into the body of a fish, he has to undergo the evolutionary process step by step. If one is on the top of the stairs and somehow falls down, he again has to go up the evolutionary staircase step by step. Of course the scientists are busy making so much research that they cannot understand this. If you tell them they are going to be trees in their next life, they think you are speaking nonsense. After all, what can we learn by research? When the, the cause of all causes is known, then everything knowable becomes known, and nothing remains unknown. As the Vedas state: Yasmin vijnate sarvam evam vijnatam bhavanti. If we know the Absolute Truth, all other truths become known, but if we don’t know the Absolute Truth, we are in ignorance. One may not be an official scientist or philosopher, but he may challenge anyone and talk boldly if he only knows one thing-Krishna. This contemporary civilization is so proud of its independence, but actually it is so much dependent on oil. If the oil supply is stopped, then what will these rascal scientists do? They cannot do anything. Let them try to manufacture oil in their test tubes, enough oil to run their civilization on. At present there is a scarcity of water in India. What can the scientists do about this? They may know the chemical composition of water, but they cannot produce it when there is a great scarcity. They require the help of clouds, and all that is God’s manipulation. Actually they cannot do anything. They have gone to the moon, but for all their labor they have simply taken away some dust and rocks. The rascal government exacts taxes and spends money unnecessarily. This is their intelligence. It is a state of asses, that’s all. The politicians have no sympathy or compassion. They do not consider that the hard-earned money is coming from the public and that they are spending it by shooting big rockets off to other planets. All they do is promise to bring back more dust. First they may get a handful of dust, then they promise to bring back tons of dust. What is the meaning of all this? Karandhara: They believe that there may be life on Mars. 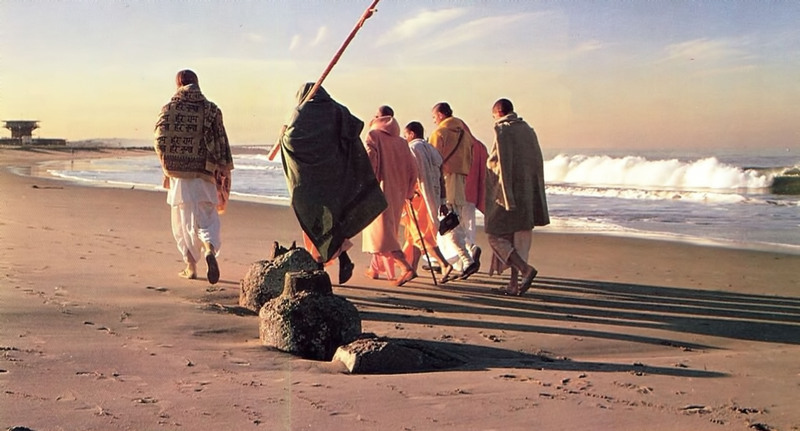 Srila Prabhupada: They may believe or not believe—what is the gain? What we do know is that life is here. They know this, yet they are engaged in fighting and in killing life. Here is life. Here is a human being. Life is here undoubtedly. But they are busy trying to destroy it with their big bombs. This is their scientific advancement. Svarupa: They are very curious to know what is going on on other planets. 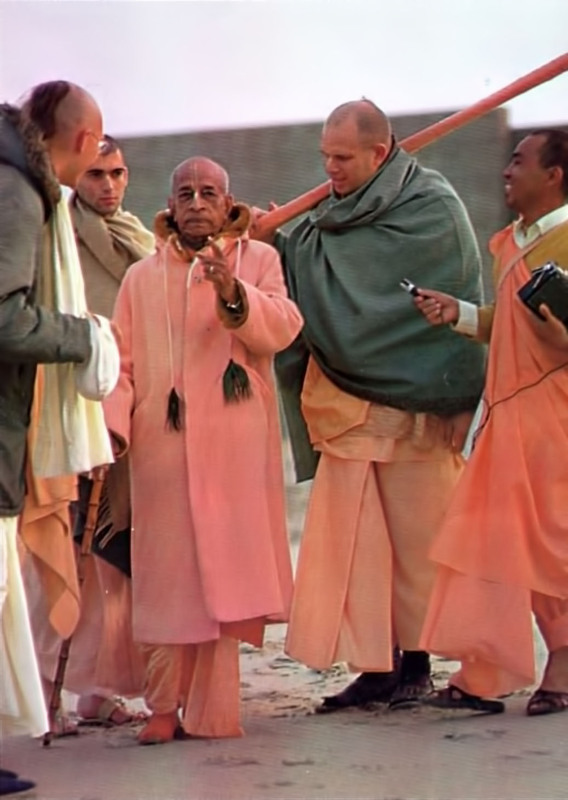 Srila Prabhupada: That means that for their childish curiosity they are spending so much money. They can spend so much to satisfy their curiosity, but when so many poverty-stricken countries ask them for help, they say there is no money. They are very proud to go to the moon, but why don’t they take information how to go to Krishna’s Goloka Vrndavana? If they go there, all their curiosity will be satisfied. They will learn that beyond this inferior energy there is indeed a superior, spiritual energy. This material energy cannot work independently. The spiritual energy has to join it. Material elements are not created of themselves. It is the soul that is creative. We may try to make something with matter, but matter does not create itself. Hydrogen and oxygen will only come in contact when moved by the superior energy. Only fools can expect the entire cosmic manifestation, which is only matter, to come into being automatically. We may have a nice car, but if there is no driver, what is its use? Unless a man knows how to work a machine, unless a man pushes a button, the machine does not work. Similarly, without the superior energy, the material energy cannot act. Behind this wonderful cosmic manifestation is the direction of a superior energy. All this information is given in the scriptures, but still people will not believe it. Actually everything is God’s property, but people are claiming this property to be theirs or their country’s. Now they are talking about the problem of overpopulation, but the fact is that God has supplied enough. Actually there is enough land and enough food if it is properly used. People are artificially creating problems, and the scientists are helping them by giving them so many destructive devices. They simply encourage the rascals and rogues who are trying to use up God’s property, if you help a murderer or a thief, you also become a criminal. Is that not so? There is so much trouble in the world because the scientists are helping all the thieves and rogues. Thus they are all criminals. Stena eva sah. One who does not recognize the proprietorship of the Supreme Lord is a thief. Once we accept the mystic power of the Supreme Lord, everything is solved. The scientists may claim that life starts from dull matter, but we are saying that life starts from life. We can actually see that birds are begetting birds, beasts are begetting beasts, and human beings are begetting other human beings. Life comes from life, and we have proof of this, but where is the proof that life starts from dull inert matter? Just give one instance of life arising from matter. The scientists may claim that life began with some chemical, but they cannot tell us where this chemical comes from. If there were such a chemical, it came from God, the Supreme Life. That is our answer to the scientist. What do you think his reply will be? Svarupa: The scientist will reply that he cannot believe it. Srila Prabhupada: That is nonsense. You can see that ordinary life, a tree, for instance, produces so many chemicals. How can one say that he does not believe this? An ordinary fruit like an orange produces so many chemicals. One can actually see this. An ordinary tree, which is a living being, produces so many chemicals. The Supreme Lord is the supreme living being. Whatever we have in minute quantity, God has in infinite quantity. That is the difference between God and the living entity. Man can produce a little water in the form of perspiration, but God’s perspiration can produce unlimited seas. We have the same potencies as God, but we can only produce a little. God can produce things in enormous, unlimited quantity. We are limited, and He is unlimited. We may have some powers, even some mystic powers, but the storehouse of all power is God. God is full of all mystic power. Therefore Krishna says in Bhagavad-gita: “With a single fragment of Myself I pervade and support this entire universe.” [Bg. 10.42] There is so much evidence of this in scripture and in life, but the rascals do not accept it. Our mission is to bring these rascals to their senses. Now one must find out the means to do this. The rascals are suffering but because they are sons of God they should not suffer. They do not know that there is God or that there is happiness. They know nothing of bliss or of eternal life. They are carrying on so much research and living for fifty, sixty or seventy years. After that they do not know what is going to happen. They have no knowledge that life is eternal. Actually their position is like that of an animal. An animal does not know what is after death, nor does he actually contemplate death. He does not know why he is here, nor does he know the value of life. Under the influence of maya, the animal simply goes on eating, sleeping, defending, mating and dying. That’s all. People are endeavoring so hard, but for what purpose? They say that they are struggling so hard to make provisions for the next generation, but what are the provisions for? They cannot reply to that. This Krishna consciousness movement is meant to give real purpose to life by establishing Krishna, God, as the center of everything. It is therefore to the scientist’s benefit to understand this important movement.